O chief of the Bharatas, know that whatever you see in existence, both the moving and the nonmoving, is only a combination of the field of activities and the knower of the field. Both material nature and the living entity, which were existing before the creation of the cosmos, are explained in this verse. Whatever is created is but a combination of the living entity and material nature. There are many manifestations like trees, mountains and hills which are not moving, and there are many existences which are moving, and all of them are but combinations of material nature and the superior nature, the living entity. Without the touch of the superior nature, the living entity, nothing can grow. The relationship between matter and nature is eternally going on, and this combination is effected by the Supreme Lord; therefore He is the controller of both the superior and inferior natures. The material nature is created by Him, and the superior nature is placed in this material nature, and thus all these activities and manifestations take place. From this verse till the end, the Lord expands on the meaning of what he already spoke. Know that all living entities (sattvam), whether low or high, non-moving or moving, are born from the combination of field and knower of the field. 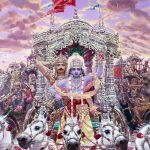 13.27 Whatever being is born, whether it be movable or stationary, it is born only from the mutual combination of the Ksetra and Ksetrajna. 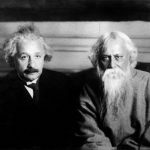 The sense is that it is born only from this combination, i.e., is born as a compound of the two and never in their separateness. 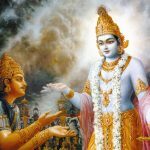 Even after elaborating upon the applicable perennial principles applicable to all creation Lord Krishna again refers to the purusa or Supreme Being and prakriti or the material substratum pervading physical existence. The word ksetrajna refers to the Supreme Being. The word ksetra also can refer to Sri-devi or Laxsmi-devi the spiritual shakti or feminine energy of the Supreme Being. Being superior to all jivas or embodied beings she is always identified by one word, Sri denoting majesty and opulence. How is this to be understood? Sri is the embodiment of pure consciousness and is eternally dear to the Supreme Lord. She never disintegrates and is thus the fertile field of inexhaustible potentiality for the Supreme Lord. Energised by Sri the foremost of all jivas or embodied beings, the secondary creator known as Brahma combines the ingredients which manifests the material worlds. Having willed to create the jivas from Brahma are bestowed the aham-akar or ego from Shiva, the buddhi or intellect from Parvati from through the knowledge of the word is obtained. Then Indra, Skanda nad Aniruddha cause the mind to ascend. The moon causes the ear to hear. The sun causes the eye to see. The Maruts cause touch to be felt. Varuna causes the tongue to taste and the Aswins causes the nose to smell thongs pleasant and unpleasant. Agnis the firegod causes the Vak to speak. Hands should be known as the instruments of the sons of Vayu known as the Maruts. Feet are activated by the children of Shachi born of Vedic rituals. Yama is Payu or waste since he expels the things eaten. Shiva and Manu are being the progenitors are known as upastha the establishers. Since Vinayaka removes the obstacles from people he is known as akasha or space. Marichika the son of prana or primal breath is known as earthly wind. Prithivi is the goddess sustaining the Earth. Varuna the demigod in charge of water is the presiding deity of birth and death. Five sons of Shiva are the presiding deities of the Shabda or five sounds which they are associated with. Prana is known as happiness, Saraswati as vigour and energy, Sri as consciousness and will being associated with those attributes. Like Saraswati the wife of Vayu is also known by vigour and energy. According to circumstances Sri is also known by various names as well even though her principle qualities of majesty, opulence, consciousness and will are foremost. Kali presides over misery and hate. Dwapara over jealousy and envy. Among the demons Kali is more powerful. In this way the various deities and demons preside over their respective attributes. Everything animate and inanimate in all of creation is to be known as the ksetra or field of activity because it where the Resplendent Supreme Lord abides omnipresent in subtle forms. Because He abides in all jivas as paramatma and permeates in a subatomic state of consciousness all existence as the brahman he is known as ksetra. Also He is known as ksetra because at the time of pralaya or universal dissolution like inhaling He modifies all animate and inanimate things back into Himself and at pralaya’s end when creation begins, like exhaling He modifies all animate and inanimate things back into their original forms and natures. By modification of the ichha or will to be compatible with every element and dimension in creation He is known as ksetra as well. All these modifications are considered extraordinary because they establish the embellishments of the distinctive attributes. The action creates something extraordinary and is therefore a singular distinctive modification. The result manifested does not cause any modification or mutation to the original and therefore modifications such as will, ego and others become the presiding deities. 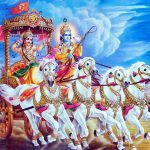 Since all these are seen by the Supreme Lord who completely energises them all in perfect unison; He is known as ksetrajna as well, the knower of the field. In some places in the Vedic scriptures it is stated that the atma or immortal soul is the body but this denotes the consciousness within the body. Manifested in a body as one born the jiva is said to have taken birth with the body but this is because it appears as such. The mode of goodness is known as satva which sometimes is referred to the Supreme Lord and sometimes even referred to the jivas but that is in regard to the atma or immortal soul which is the eternal part. The Shabda Nirnaya states that satva is the attribute of noble righteousness. 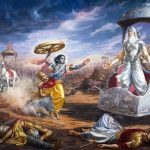 Thus Lord Krishna has explained that discriminatory knowledge of the atma or immortal soul and discriminative knowledge between the purusa the supreme being and prakriti the material substratum pervading physical existence insures one surpassing samsara the perpetual cycle of birth and death. From this verse until the end of the chapter He deliberates on spirit and matter in elaboration of His previous statements. In this verse He clarifies that the combination of spirit and matter is the cause of all living entities taking birth throughout creation with the words yavat kincit meaning whatsoever and stavara-jangamam meaning stationary or mobile and sanjayate meaning are born. All absolutely arise from the combination of matter and spirit and not from just matter alone. yāvat — whatever; sañjāyate — comes into being; kiñcit — anything; sattvam — existence; sthāvara — not moving; jańgamam — moving; kṣetra — of the body; kṣetra-jña — and the knower of the body; saḿyogāt — by the union between; tat viddhi — you must know it; bharata-ṛṣabha — O chief of the Bhāratas.